Simple, inspired by the hands behind work. I have to say that the work in life does not seem quite as busy as in these photos, and there is no real sense of volume, but we do as best we can to depict the pots properly. So, a lot going on here, this work is different and also in some ways similar to the other pots I have made recently. You might notice the central figure is clothed or covered up, her texture is like the roughness of the life encircling her... still bordered by the naked texture of the original thrown pot. This figure is like a woodland nymph, nature allegory, her hair like flames or bark... she is very abstracted, almost twisted and deformed, she actually has no bottom, her skirt flaring out like flower petals to reveal a secret opening, blocked by stacked versions of stylized birds. She has symbols of abundance around her waist, fruit, flowers, and growth forms. On either side of her, shoots, stems, sprouts, and fungi emerge and climb upward, on the left of the pot where her opening points, a cascade of flowers runs down towards the base of the pot, there are fruits reminiscent of pineapples, strawberries, apples and grapes. This left side of the pot is very abundant, there are stacked root vegetables and what looks like eggs. On the right of the pot is a different approach. Instead of growing forms, towards the bottom of the sculpted portions, there are simply placed objects, this is the cast away part of the commentary, the temporariness of modern convenience, basically trash. You can identify cups, mugs, bowls, square objects, forks, spoons, some sort of ladle or shovel, and a plate, all showing the other side of things, the man made and discarded part of life. Take a gander at these CRISP phtotos of the super detailed work from greenwich house bisque fired! This work is stunning, everything is handmade, there are no wheel trimmings as borders or anything, and its just an abundant display of the flourishing life, of the expansion of self, of the desire to return to nature. The work has yet to be glazed but I am seriously considering just leaving it like this... will decide later. Finally I am getting work fired again! I am done with Greenwich house, so this is the first work (thought made at greenwich) fired at city, its the one I had dubbed a deflated basketball, but its really quite quite nice. There it is in the kiln in the upper right portion. I enjoy these high contrast photos caused by the sun. Here is the new hands pot. This work of art almost didn't exist because the shape of the thrown vessel was unappealing to me, but I was able to alter it by folding it twice (as opposed to once per usual) and creating the usual shape that I like. The top entrance/opening was so beautifully done by itself that I left it unaltered. This pot really is a very nice one and its funny Bill might think it interesting because I began this while he was here, going with the flow as they say, thinking how bad an idea it was not to have the composition figured out, but it worked. Originally there was a tree in the center, this tree was turned on its end and made into this figures feet which abstract into roots. The scene (sans central figure) is totally flora, there are no butterflies, dragonflies, frogs, birds (what!?!) or turtles, there are just lots of plants coming up and growing about, the figure looks off to the side gently and there are hands in the work, even though you might not see them at first glance. This work is rather small at seven inches in height, here is my hand for scale. Here are a few photos of a sculpted pot that I recently made, the design idea was to create a wreath around the figure with sculpted elements which increased in size as they moved down the pot towards the base. The figure is rather small and a little lost in this particular one, however, there are things (like the fungi) about it that I enjoy. Check out this beautiful candid photo at the wheel at City. Thinking of form again. Like I said in recent blogs, I enjoy the slenderness of the taller pushed in pot as long as the height is in the top part and not in the rotund bottom part, These pots are more dramatic and give a vertical dimension to the "scene" which is the focal point of the work, they also allow the sculpture to be upright instead of seated in the pot. The first form above is close to perfect, the lines are natural and beautiful, they remind of the leaves and rosebuds that I sculpt on. All forms are reminiscent of the female anatomy, but these have more narrow openings which I prefer. The second form has a nice shoulder on it, variety of form is exciting and keeps the works fresh. Here is the sketch I did with a reguar pen at the laundromat on the 13th for the animals that I wanted on the transformation pot. Check out this latest pot, its a game changer, moving more and more into the direction that the work needs to go into. As much as I praised the rotund, squat pot, this one is more slender and tall, but tall in the right places which made all the difference, its taller on top, not at the bottom, so its still bud shaped but with an elegant edge. There is something about "glaze shell" the work in Jane Hartsook that I really enjoy, the very narrow opening... this is to be recreated in the next couple of pots, these round openings are very "pottery" but the thin one is way more intimate and feminine. 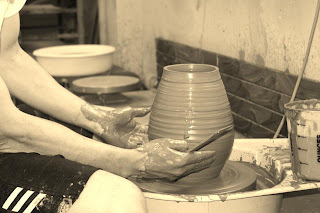 The smoother roughness of the "rocky" parts which are pottery wheel trimmings break up the extreme business of the sculpted "natural" elements. The work is full of allusions to my childhood as well as some current life experiences. I actually sketched a few photos of the animals I remember seeing as a kid and also threw the quetzal in representing my trip to Guatemala a few years ago. This photo is not really in focus but I wanted to show this little "scene" which is like a little outcropping of life, flowers bloom, buds sprout and birds interact with each other. On the other side there are the virginian things, land turtles, tree frogs, insects. The growth at the feet of the figure took a while to sculpt even though they are not super plentiful, as I make these now I step back every few minutes and take it in, assuring myself that I am not overdoing it, keeping areas of sculpted textures, trimmed bare "rock", and the lines of the thrown pot itself all visible from the front. This work of art is a success! Composition - what turns you on?